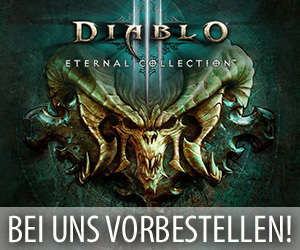 Wie bereits vor einigen Wochen auf den einzelnen Communityseiten von Diablo 3: Reaper of Souls angekündigt wurde, haben die für dieses Action-Rollenspiel verantwortlichen Mitarbeiter von Blizzard Entertainment im Verlauf des heutigen Abends nun endlich den neuen Patch 2.6.0 auf die nordamerikanischen Liveserver aufgespielt, der leider erst irgendwann in der Nacht von Dienstag auf Mittwoch in Europa erscheinen soll. Gleichzeitig damit veröffentlichten die Entwickler dann auch noch die finalen englischen Patchnotes zu diesem neuen Update, die selbstverständlich auch dieses Mal wieder ganz genau auflisten, was für Änderungen und Neuerungen dieser Content Patch eigentlich mit sich brachte. Wer nun also mehr über die Inhalte von Patch 2.6.0 erfahren möchte, der sollte sich jetzt sowohl die folgenden Patchnotes durchlesen als auch einen kurzen Blick auf das in dieser Übersicht vorhandene Vorschauvideo des Entwicklerteams werfen. Last updated June 27 @ 11:00 a.m. PDT. Diablo III patch 2.6.0 is now live in the Americas for PC, PlayStation 4, and Xbox One! Check out the full PC patch notes below to learn all about the latest changes. To view the console notes, please click here. Note: This class is available through the Rise of the Necromancer pack. For more details, please click here. Over 30 new Legendary items have been added for the Necromancer class, along with four class-exclusive Sets featuring unique themes. Set Dungeons have also been added for each of the new Sets, providing you new opportunities to test your mettle. Explore new builds created by your fellow players in a weekly static dungeon! You can access these through the main screen, similar to Adventure Mode and Campaign Mode. Four new Waypoints have appeared in Adventure Mode. Each one has bounties to complete. These Realms of Fate are the unintended consequences of the battle between the nephalem and Diablo in the High Heavens. Important: Please note that you will not be prompted to download Patch 2.6.0 until the patch is live in your home region. If you are logging in from a European or Asian client, you will need to wait for this patch to release in that region before it can be installed. Additionally, if your home region is in the Americas, you will be unable to log into Europe or Asia using Global Play after Patch 2.6.0 is live until those regions have also patched. Summon a piercing bone projectile that causes 500% weapon damage to all enemies it passes through. Bone Spear turns into Blood Spear. Damage is increased to 650% weapon damage at the cost of 10% health. Raise a contaminated mage that channels an aura of decay for 100% weapon damage for its duration. Bone Spirit will now charm the target for 10 seconds at the cost of 5% health. Now commands your skeletons to explode, dealing 215% weapon damage to enemies within 15 yards. A crippling curse that reduces the enemy units’ movement speed by 75% and reduces damage done by 30% for 30 seconds. Damage reduction increased to 40%, but no longer reduces movement speed. Curse the target area. Cursed enemies have a chance to heal the attacker when they are struck for 2% of their total health. Lasts 30 seconds. Now curses the ground, healing you for 1% of your maximum life every second for each enemy in the cursed area. Target an area exploding all corpses within 11 yards dealing 350% weapon damage to enemies within 20 yards. Corpses pull themselves towards the nearest enemy before exploding, but Corpse Explosion now costs 2% life per corpse. Target an enemy to summon projectiles from nearby corpses that cause 1750% weapon damage to the target. Spend 2% of your total health to launch an additional lance from yourself towards the target that deals 250% weapon damage. Bone Spear, Bone Spikes and Bone Spirit have a 30% chance to trap enemies in a Bone Prison for 3 seconds. Picking up a health globe removes the health cost of the next Blood spell. This effect can stack up to 10 times. When you take lethal damage, you are sustained preventing all incoming damage for 4 seconds. In addition, you consume minions to heal for 10% of your life per minion. This effect cannot occur more than once every 60 seconds. While using a scythe gain 2% Essence and Life per kill. Blight abilities also slow enemies by 30% and reduce their attack speed by 30% for 5 seconds. Bone Spikes, Bone Spear and Bone Spirit deal 1% increased damage for every 2 yards between you, up to a maximum of 20%. Your Cold skills reduce the movement speed of enemies by 30%. In addition, your movement speed is increased by 4-5% for 5 seconds. Each corpse consumed in the Land of the Dead grants a stack of Macabre Knowledge. Macabre Knowledge increases the damage of Corpse Lance and Corpse Explosion by 150-200% while outside Land of the Dead. Devour restores an additional 75-100% Essence and Life. In addition, when Devour restores Essence or Life above your maximum, the excess is granted over 3 seconds. Corpse Lance damage is increased by 25-30% for 3 seconds when you consume a corpse. Max 20 stacks. You gain 1% damage reduction for 15 seconds each time one of your minions deals damage. Max 50 stacks. While at full life, your healing from skills is added to your maximum life for 45 seconds, up to 100% more. Bone Armor also activates a swirling tornado of bone, damaging nearby enemies for 750% weapon damage and increasing the damage they take from the Necromancer by 2750%. Each enemy you hit with Bone Spear reduces your damage taken by 2% up to a maximum of 50%. Lasts 15 seconds. When a pet deals damage with this gem equipped, bonuses are now always granted from the player to the enemy hit instead of from the pet to the enemy.